The event will take place between 2pm and 7.30pm in the event space of the WERK1 in Munich. Around 100 attendees are expected. The EU-Startups Conference, which will be held in English, will be the perfect event for startups that are aiming to enter international markets. We will have fireside chats with 3 internationally successful founders/CEOs out of the Internet space and a pitch competition with 9 startup teams. Bernhard Niesner – the Founder and CEO of the world’s largest language learning community busuu.com! Headquartered in London, busuu aims to change the world by providing language learning around the globe for 40 million users with 40k+ new users joining every day. Bernhard is a perfect example for the fact, that globally successful Internet companies can also be build out of Europe. 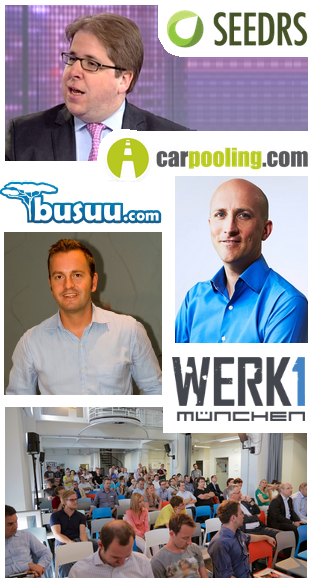 Markus Barnikel – CEO of the world’s leading ridesharing marketplace carpooling.com. We’re going to talk with Markus about the sharing economy, the challenges and opportunities of beeing a European startup and many more topics. Jeff Lynn – Co-founder and CEO of Europe’s leading equity crowdfunding platform Seedrs. At the EU-Startups Conference we’re going to talk with Jeff about equity crowdfunding in Europe and the future plans of Seedrs. Markus Grundmann, Associate at the Munich-based Venture Capital firm Target Partners. If we already got your attention and you’re able to be in Munich at that time, we highly recommend you to purchase your ticket now! The pitch competition during our small/intimate conference will host 9 startup teams. Participating startups are going to pitch their business idea within a 5-minute-presentation in front of the audience and an expert jury. There will be no cash price, but the winner will receive 500$ in AWS Credits and will be prominently featured on EU-Startups.com. Hiscox is an English specialist insurer with a hundred years of tradition. The special products which the insurer offers directly online are professional liability insurances in the field of IT, marketing, consulting and other service occupations. These insurance products are offered especially to self-employed individuals, freelancers and small businesses (up to 2.5 million in revenue).